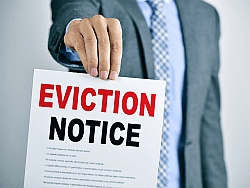 Just take into account the possible difficulty, cost and delay of evicting a defaulting tenant – or indeed any unlawful occupier – who refuses to budge. The problem of course is that you have to keep on paying all your property expenses whilst the legal processes grind their way slowly, painfully and expensively through the courts. The practical position therefore is this – 4 years down the line, the investor is still fighting for vacant occupation. Litigation like this doesn’t come cheap and whilst the occupiers carried no legal expenses, the investor ran out of money and in the end had to rely on his attorneys to represent him pro bono (free of charge). And that ruling – from our highest court – raises the risk factor for landlords, as we see below.